Beat the eggs well in a bowl, add milk, sugar and cardamom powder and mix well. Heat a frying pan and grease it using ghee or oil. 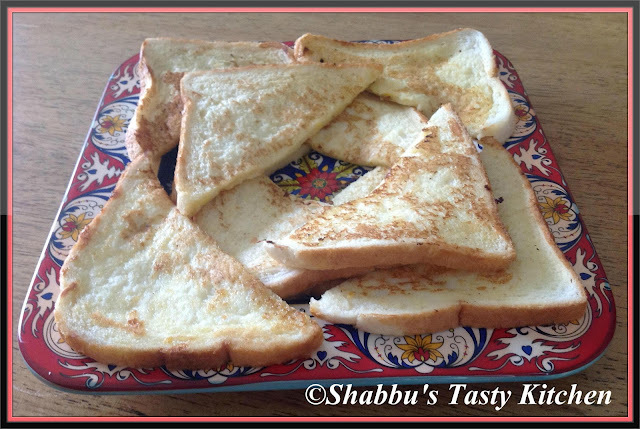 Dip each bread slice in the egg-milk mixture and toast/ fry both sides till golden brown on low-medium heat. Serve as a snack..
Yummy, look delicious. Love the addition of cardamom! wow, delicious platter and looks so scrumptious. French toast is a kids delight always...my kids used to love it too when they were small. My all time fav, simply love it. Nice blog, your french toast look delicious. It is a good Ramadan Recipe / Good luck on your entry to halal foodie.